​To preserve the beauty and integrity of the land for future generations by fostering meaningful connections between agriculture and the community. To grow the best tasting apples possible and share the joy of the harvest with our community every year. 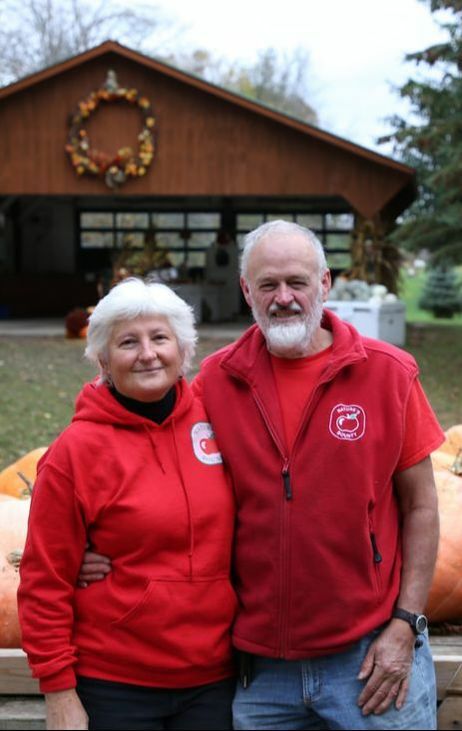 Cathy McKay and Marvin Stevenson met as grad students at the University of Guelph in 1976 and shared their dreams of someday owning a farm. Lured by its natural beauty and rolling hills, the young couple purchased a 100-acre property west of Port Perry in 1979 and moved into the original farmhouse. In the spring of 1980, they planted their first five acres of apple orchard and started a small flock of sheep. During the first few years, the couple revitalized the property by removing debris, grazing the sheep on pasture and planting new rows of apple trees. By the 1990’s, the early plantings came into production and the couple was eager to share the joy of their harvests with the community. They opened their farm to the public in 1993 and offered a pick-your-own experience unlike any other in the area. With nearly 40 years of growing experience, Cathy and Marvin still find excitement in watching their orchard move from vibrant blossoms in the spring, to lush green rows in the summer and a bountiful harvest each autumn. Many families who visit the farm seek a much needed break from the hustle and bustle of everyday life to enjoy an afternoon picking fresh, crisp apples, watching the sheep and savouring the beauty of the farm.